Anyone who has read his contributions as a regular scribe for Rhythms, has seen him perform live over the last 25 years, or has listened to his recorded output would appreciate the extent of Nick Charles’ musical knowledge and expertise over a wide range of roots music. His guitar virtuosity is best exemplified however, in blues expression. “Into the Blues” takes Charles full circle back to the beginning of his musical journey of discovery when he was first transfixed by the music of Big Bill Broonzy, Blind Blake, Mississippi John Hurt, Blind Boy Fuller, Tampa Red, Scrapper Blackwell and Robert Johnson. 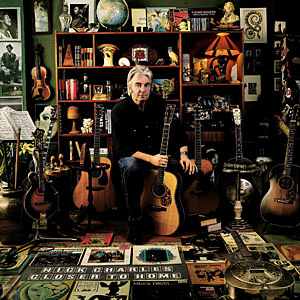 Playing six and twelve-string acoustic guitars, resophonic guitars and mandolin with dazzling finesse, Charles performs both in solo mode and with ensemble backing comprising Howard Cairns on double bass, Michael Jordan on drums, Bruce Haymes on piano and his old running partner Alex Burns on harmonica. From his warm, expressive vocals to his dexterous fingerpicking and earthy slide, Charles’ mastery of the country blues in its various shapes and forms is striking. Whether it’s pre-war jazz inflected picking in the style of Lonnie Johnson, folk blues, Delta or Piedmont, Charles is the consummate talent. And besides impeccable readings of songs by Broonzy, Hurt, Tampa Red, Otis Rush and Peter Keane, his self-penned compositions here reflect an aggregation of all those influences. Once upon a time, every acoustic guitarist worth his salt employed a fingerpicking technique. Nowadays it's something of a dying art. Return of the Travelling Fingerpicker showcases one of the finest exponents of this style in Australia. Melbourne's Nick Charles may bot possess he razzle-dazzle of the likes of Tommy Emmanuel and Michael Fix, but there's no lack of bravura. Charles uses not overdubbing or studio trickery, or accompaniment on his self-produced third solo album. What you get is 10 original instrumentals, two covers and two standards, ll performed on steel-string guitar in a wide range of styes. That his own compositions Lullaby For Hamish and Paul’s Song are as melodious as Lennon and McCartney’s I Will underlines the artist's ear for a tune. Charles’s version of crowd-pleaser Lily Was Here delivers more that Candy Dulfer's original recording. Of the original pieces, Back in the Day proves a natural sequel to the Joplinesque Silent Movie, and the later a perfect companion to the elegant December Rag, The guitarist gets down and dirty on Kelpie Blues, bending the strings on his battered dobro with the zeal of a Mississippi Delta veteran, While Heartstarter would have made for a livelier opener than the title cut you can understand why the old trouper opts to save the best 'til last. 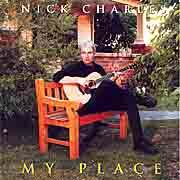 Melbourne guitarist Nick Charles continues to write highly accessible melodies that insinuate themselves into your consciousness. On his latest album, the acoustic player delivers a dozen tracks that range from folk and blues to bluegrass, ragtime and jazz. 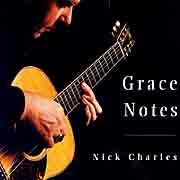 Nick Charles plays acoustic guitar with the deceptive ease of a virtuoso. Having consolidated his Australian reputation, he’s been winning plaudits overseas and was recently signed to California’s Solid Air Records. His latest local release, New Kind of Feeling, is not so much a departure as a logical, upbeat progression with several appealing vocal tracks and the emphasis on original compositions. Charles has technique to burn: check out the finger-twisting First Crossing and Ribcracker, or the supple ragtime on The Shearwater Shuffle. Yet the emphasis is always on melody and feel, the music accessible and audiences — pickers and punters alike — are never disappointed. One cover sure to win airplay on grown-up FM is Peter Green’s spaced-out Albatross. The standout is Say What You Mean, marrying laconic vocals with a great jazzyblues arrangement. Charles closes with the pensive, rainbacked Bus Station Blues, but adds an extra, unlisted track with a neat variation on Basin Street Blues. Guitar players fall into two easy divisions; derivative wankers and gifted musicians. Nick Charles who plays a delicious and totally convincing version of Fleetwood Macs Albatross on this delightful album is firmly in the latter category. He plays like an angel. He writes good songs and sings with conviction and seems to nod in the direction of Leo Kottke and English folk based virtuosos such as Davey Graham and Nic Jones. This is one of those albums people put on when they feel in a mellow mood and want to lie around feeling that the world is a pretty good place. Any new album is a voyage of discovery for the listener, that’s understood, but for the artist? 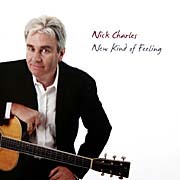 Nick Charles noted the water theme in the essay that accompanies his New Kind of Feeling album, but is pleased when others detect an air of optimism. “I wasn’t aware of (the optimism) until I was finished,” Charles said. “It is more upbeat, but I hadn’t noticed because I was so immersed in recording. I often don’t realize what’s happening with a record until it’s over. “Essentially, that’s why it’s called New Kind of Feeling. I’ve been called gloomy on past albums. Black Market Music chief John Durr says the record came together over time. Charles would drop off three, four or five completed songs before disappearing on his next tour. That method allows the guitarist to accumulate material and minimize the pressures of producing an album from a shorter session. “I find recording a really stressful process,” Charles said. “I play live and then record it, and I’m not happy with it. “I’m a perfectionist. I don’t like doing edits. The painstaking process is plain to hear on a sublime set of 15 tracks, 12 of them originals. “They are quasi-rootsy things with classical elements,” Charles said. “I’ve been playing guitar for 30 years and…I have been obsessed with guitar music”. “You start with the Beatles and Stones, and I just discovered the roots of it pedalling back from there. “Once I finished up with country blues of the ‘20s and ‘30s, I had found my reference point, my focus. Equally the tracks reflect the guitarist’s travels and environment. He attributes the water theme to the break in the drought around Wild Dog Creek in Victoria. “My first US tour I did by the Greyhounds,” he said. Charles finds his voice on this album, singing on four of the fifteen tracks. One of the standouts is Say What We Mean, where he takes the clichés about a failing relationship and knits them into a wry piece. But the album is more about guitar than voice. “I’ve written a lot more lyrics than I have recorded. But sometimes they don’t fit with my instrumental music,” he said. “I’m basically writing all the time. Writing is essentially my practise these days. “When I have enough music I record. Charles will take his guitars and head out on the road, with trips interstate to launch the new album. There is something special about albums that demand attention without screaming for it. This music should be heard free from distractions, almost as it sounds in Bus Station Blues, in a cabin with rain falling. Charles draws the listener in with his beautiful playing, then traverses the acoustic guitarist’s landscape of folk, country and blues. There’s the lively fingerpicking of Pig in a Blanket, the well- argued relationship breakdown of Say What we Mean and the wonderful LA Melody. Charles wrote 12 of the 15 tracks, all turning on his abilities with whichever guitar – and he plays four on this album. When he sings – on four tracks only – he has a country tinged voice, a nice fit for the cover of Peter Keane’s You Haunt My Dreams. The album is bookended by two of it’s best tracks – the title track and Bus Station Blues – both instrumentals and both amazingly expressive. "every movement is logical; every phrase musical....his Ship to Shore should be a standard." "Travelling Fingerpicker is dazzling in its musicianship." Brian Wise, Rhythms Magazine. You don’t quite realize just what a fine player Nick Charles is until you see him close up. The fingers literally fly across the frets as if more than two and a half decades of performing, recording and touring have honed his skills to perfection. Having released the acclaimed albums, “My Place” and “Grace Notes”, it seems to me that the latest album, his back-to-basics record, is Charles’ most accomplished work. It runs through a gamut of styles on the ten original songs and two covers – almost a potted history of the guitarist’s influences. Charles notes that the album reflects his musical journey over the years - a journey that was inspired in his youth by a Big Bill Broonzy record. The music moves from the gentle “Ship to Shore” and “Two Wells” through the “St. Jude Rag” into Norman Blake’s “Down at Millows House” while the other original compositions range from the sublime, as on “Anywhere with You” to the jaunty “Deep Creek Turnaround”. Charles’ interpretation of Lennon and McCartney’s “Norwegian Wood” unfolds beautifully, breathing new life into a melody we must have heard thousands of times before. Of course, a large part of the enjoyment of Travelling Fingerpicker also has to do with the fabulous sound of the Santa Cruz Dreadnought guitar (and its heavy steel strings) along with the engineering of Chris Corr, who manages to get an extraordinarily rich, warm sound. I daresay there are much flashier guitarists, who have a higher profile, but they don’t play with the sort of feeling you can hear on this album. While I recently had the opportunity to watch Charles from a few feet away in some radio studios and have marvelled at his skills - which I am not sure that I ever fully appreciated before - I also saw him from a more distant vantage point at the recent album launch and was equally impressed with his stagecraft. Charles has performed at international festivals from Edinburgh to Kansas, including a recent trip to the US, and he supported people such as BB King, Taj Mahal, Guy Clark, Chris Smither and Dan Crary. Over the years his presence on stage has developed substantially, an achievement for one who seems to be naturally quiet. These days he will preface his songs with brief stories, humorous remarks and, at the launch, he even managed to deal skillfully with an over-enthusiastic fan who felt obliged to give a running commentary from the floor. This was almost as impressive as the music - it is hard enough being on stage with a just a guitar as a shield. It is easy to understand while Charles has been getting such a great response overseas and why his album launch was packed. Travelling Fingerpicker is dazzling in its musicianship and something that hopefully might act as a calling card for even bigger things. Although Charles has the chops of a John Fahey or Peter Lang, his songwriting never comes second to technique. The Aussie has a well-developed melodic sense: every movement is logical; every phrase musical. His Two Wells should be a standard, and his Angie-inspired Jasmine and cover of Norwegian Wood are magical. 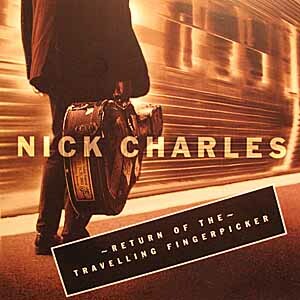 Fingerpickers rejoice: Nick Charles is back with another elegant, six-stringed saunter across the soundbox. His solo debut, My Place, revealed this local musician to be an exceptional acoustic guitarist and Grace Notes reinforces the point. A more focused recording, it contains nine original melodies among the 10 tracks (the exception is a freehand rendition of Spanish Harlem) and Charles ranges across folk-blues, ragtime, jazz and bluegrass. Standouts include stylish nods to Kenny Burrell on the cool, flamenco-accented Kenny’s Blues, and to Chet Atkins on Walkin’ the Blues, accompanied by double bassist Howard Cairns and violinist Matthew Arnold. Favourite track: Sometimes the Way is Clear, a beautiful, swelling, hymn-like refrain featuring Chris Bitcon on lap-dobro, bassist Cairns, and crisp guitar and mandolin from Charles. Turn up the volume and give the sub-woofer its head! 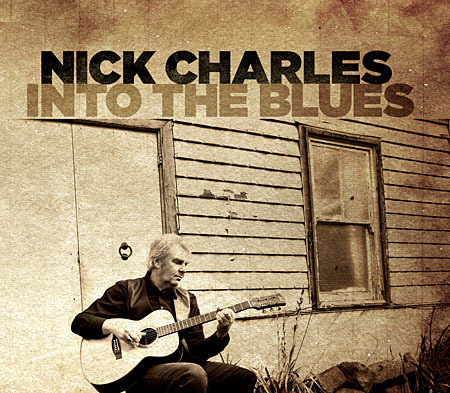 Melbourne guitarist Nick Charles has grasped the nettle and put out an outstanding instrumental work of acoustic rags and fingerpicking ballads. He wrote seven of the 13 tracks, which also include chestnuts from Joni Mitchell, Doc Watson and John D. Loudermilk. 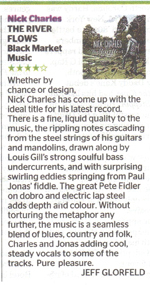 Reminiscent of Chet Atkins and Jerry Reed in the early ‘70s, My Place is an understated masterpiece for the ever-composed Charles. It will astonish listeners with its brilliantly coloured lines. The Loudermilk fingerpicking charmer Windy and Warm is impressive in its artistic bravado. Solo instrumental albums like My Place are a risk, but Charles triumphs. Stuffed full of surprises and instrumental undercurrents, it creates the impression of a small lyrical string combo at play, as demonstrated by Doc’s Guitar, creating its own pictures. In this case, a fast-forward chase up an Appalachian mountain the 1930s will do.